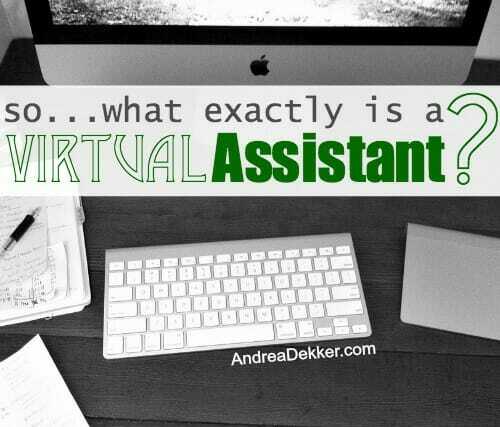 So…What Exactly Is a Virtual Assistant? Better late than never though… right? 1. I’m working at my desk — which is where I do almost all my VA work. 3. I have a new shirt! Anyway… back to the post. How did you get started working as a VA? How did you find your VA jobs? What skills to you need to work as a VA? How much can you make/charge as a VA? How do you work the VA jobs around everything else you do? Any other tips or resources for those interested in VA work? I completely understand all the questions (and they don’t bother me at all). After all, I had never even heard of a “Virtual Assistant” before I started working as one almost 4 years ago. I’m definitely not an expert VA by any means, and I often can not answer all the reader questions that come my way. However, I CAN share my own personal experiences with you… and that’s what I’m doing today! Well, it’s basically just like it sounds — an assistant who works virtually (or remotely from their home via the computer and/or phone). So just think of it like any administrative assistant or secretarial position — except I don’t work in an office, I don’t have set office hours, and I usually have never met my “boss” (honestly, I’ve only met ONE of my bosses in real life). Here’s the Wikipedia definition: A virtual assistant is generally self-employed and provides professional administrative, technical, or creative (social) assistance to clients remotely from a home office. Well, that totally depends on what type of VA job you’re hired for. In my experience working as a VA and with online friends who are (or have hired) VA’s, the job possibilities are pretty much endless. Everything from editing, proofreading, and writing, to email management, social media promotion, marketing, data entry, and more. I’ve even been hired to print, fold, stamp, and address envelopes! I can still vividly remember what I was doing when Mandi from Life Your Way emailed me and asked if I would consider working 10 hours per week as her “virtual assistant”. It was November of 2010. I had just started my blog a few months earlier, we had just sold our first house, we were in the process of packing and moving to our farmhouse, and Dave and I had JUST started talking about how we might be open to the idea of having kids sometime within the next 2 years. At the time, I was still working part-time at my “day job”, I was still organizing for many different clients each week, and I was tirelessly working to get my blog up and running. I didn’t have a lot of room in my schedule for something new; however, when Mandi contacted me, I just couldn’t resist. I had admired her blog for over a year already and was eager for the opportunity to learn from her — and boy did I learn a lot! It was a fabulous experience for me, and although I don’t work for her anymore, it opened the door to a variety of new VA jobs down the road. Right now, I’m working for 4 different companies on a regular weekly and monthly basis. Deal Seeking Mom: I’ve work for Tara for several years now and I’ve done a variety of tasks over those years. However, right now, I manage and oversee her coupon database to make sure everything is working properly for her clients, trouble-shoot any issues that might arise, and help new clients with the activation and installation of their coupon databases. I obviously didn’t know anything about this when I first started, but I was already working for her site and this position became available so I decided to transition into this role. It’s been a pretty big learning curve for me, but I’ve enjoyed it a lot. Money Saving Mom: Ironically, about a year after I started working for Tara, Crystal from MoneySavingMom.com contacted me as she needed some help with massive amounts of guest post submissions she receives on a daily and weekly basis. I jumped at the opportunity to be part of the MoneySavingMom.com team, and I’ve really enjoyed my VA duties here. I format, edit, and create graphics for most of the guest post on her blog. I also help her with some social media promotion and various other odds and ends when she’s busy doing other things only she can do. Clean Mama: I’ve done some smaller projects for Becky from CleanMama.net, over the years — however, just before Simon was born, she contacted me to see if I’d be interested in a more long-term VA role. I was a tiny bit apprehensive just because of the upcoming baby, but she assured me it wouldn’t be a huge deal if I had to take off for a few weeks… so I accepted her offer 🙂 I help Becky with all sorts of Facebook stuff and have had fun helping her grow her Facebook page by thousands and thousands of fans over the past few months. Reformed Church in America: This is a local non-profit organization that I’ve worked for since college. I had an internship there, then I worked full time after Dave and I got married. I switched to part time after I started my business, and now I just do some simple VA stuff from home. I have a few regular monthly duties I help them with, but it’s mainly on an “as-needed” basis as obligations arise throughout the month. I also do some shorter projects for random companies and blogs, but usually just a couple hours here and there — no regular weekly hours. As you probably read earlier in this post, Mandi from Life Your Way reached out to me for VA help. Well, at the time, Mandi was working for Tara at Deal Seeking Mom, and when another position with Deal Seeking Mom became available, she told Tara about me. So Tara hired me way back in 2011 — and my work with her has continued to grow and morph over the years as she has offered more responsibility to me (if I’m willing to take it). I’m not exactly sure how Becky heard of me — probably because we write about similar topics so we’re in the same “blogging circle”. She is awesome and I love working for her too! The VA work at the non-profit is simply because I’ve been working for them since college — and they are a great company so I don’t mind keeping my foot in the door right now! As for all the other VA work I’ve done over the years, much of is from other bloggers who either know me from my local blogging groups, from online blog interaction, or simply because they follow one of the other blogs I do VA work for. I have never actually gone out and searched for a VA job — which unfortunately makes it really difficult for me to help others who are looking to break into the VA world. I’d love to offer a whole bunch of amazing tips and resources, but I just don’t have many. Well, this obviously depends on the type of VA work you do — but for me, I definitely need to know my way around a computer and have very reliable internet access. I need to know what I’m doing “on the back end” of blogs, I need to understand how social media works, I need to check my email on a very regular basis (and be able to respond relatively quickly). I need to be VERY detail oriented, punctual, efficient (they pay me by the hour), and professional since I’m often dealing with their clients, customers, and readers. Since my “bosses” are essentially out of the picture, I need to be very self-motivated, set self-imposed deadlines, and be able to break larger projects down into bite-size pieces without getting overwhelmed. I also need to be able to juggle a bunch of different tasks at the same time. NOTE: if any of this sounds overwhelming, just remember, I starting doing this before I had kids and each job came to me at a different time. So I didn’t just dive in head first to ALL of these commitments. They were added little by little, and thankfully, I’ve been able to adapt over time. Again, this is going to depend on the type of work you’re doing, how much experience you have, how big the company you’re working for is. etc. Also, the more difficult or specialized work you do, the more you’ll make. I know of a few friends who have very time-sensitive VA work that requires them to literally drop everything to finish it on time. They get paid really well — but that type of work would not work well with 2 small kids! When I started out, I was paid $15 per hour — which was totally worth my time for the types of tasks I was doing. I now charge right around $25 per hour for VA work — sometimes a little more if it’s a “rush job” or if it’s more technical. Another thing I wanted to mention is that sometimes you can get a few added bonuses along with your pay if you’re working for a larger company or blog. For example, some of the blogs I work for offer to put my ad button in their sidebar — this is great for driving traffic to my blog, which ultimately creates additional income for me. Since publishing this post this (about 2 hours ago) I’ve already gotten 4 emails and a comment asking this question — so I figured I should quickly update the post to reflect this very common question. First of all, read this post from last week to get a better idea of what I’m all doing right now. Since we currently don’t have any outside childcare, my prime working hours are when Dave is home and/or when kids are sleeping. I usually get an hour of work in before they wake up in the morning, and another hour in while Simon is sleeping and I let Nora watch a couple shows on Netflix. When Dave gets home (usually around 3:30) I often spend 30 minutes or so responding to emails and tying up any lose ends. Then we have ‘family time’ from about 4-7pm. 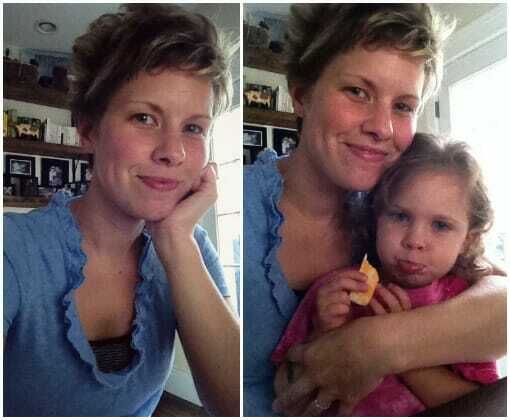 We play, go for a walk, eat dinner, get kids ready for bed, read books, etc. Right now, I put Simon to bed and Dave puts Nora to bed (I got off easy!) Simon goes to bed around 7:00 (sometimes earlier) so I can easily get a good 3-4 hours of work in once he’s sleeping. Also, I usually do work on Saturday at some point — there are always windows of time to fit an hour or so in. I think the key for me is know EXACTLY what I need to do and how long those tasks will take me. This way, if I have 30 minutes free, I can work on a quick project. If I have 3 hours free, I can work on a longer project. One resource I wanted to share is The Bootstrap VA ebook. It has TONS of information for anyone interested in becoming a VA.
Also, if you’re interested in becoming a VA but don’t have any blogging experience, I would suggest starting up a free WordPress blog. Almost every single VA job I’ve gotten has been because I know my way around a WordPress blog — so that might be a good skill to have. Finally, look for any business/blogging groups in your area (or on Facebook). That has been a great way for me to network and I’ve gotten a few VA clients that way. Whew… that’s everything I can think of right now! Do you have more questions? Ask them in the comments or shoot me an email and I’ll do my best to answer them ASAP! Thank you so much for the information.This actually provides a correct and clear information about the virtual personal assistant.Looking forward for more article of this kind. What would be some of the most basic beginner’s things to learn, in order to be a virtual assistant? I am good at proof reading and a fast and accurate typist. I have done “real life” assistance/secretary in real life but I am not up to date on computer things. I do not know how to use Excel, etc. Chris, I’d (unfortunately) say that one of the most basic beginner things to know before becoming a virtual assistant is to be VERY savvy with the computer, the internet, website/blogs, etc. That’s what you’d be doing for your entire job, so being “up to date” and quite proficient with computers and technology would be a big MUST. Thank you. I guess I didn’t word my question properly. I know that I must learn all those things. I just don’t know what specific things to learn first. I am almost 50 so the computer things I learned in high school and college are outdated. In fact, we learned programming back then, believe it or not. If I take some classes at college or online, I don’t even know where to start. Thank you so much for your help. Chris, I really don’t do anything with helping people become a VA — so I honestly don’t have any great tips or resources to share. That said, Crystal Paine from MoneySavingMom.com has lots of resources. She hosted a free webinar today (all on how to become a VA) and it looks like you might still be able to sign up to get the information emailed to you. You can check it out here. Thanks for your kind words. I’d be happy to set up a coaching call or two with you. You can find more information about that process here, and contact me with any questions. I am looking to hire a virtual assistant. Do you have any recommendations of reputable companies? Have a good skill set. This was what I learned from years and years of being a virtual assistant. The more skills you have, the more jobs you can pull off. especially the technical ones. Yes, if you’d like to talk with me in detail about everything I do, how I got started, etc. etc. we can schedule a coaching call (or more than one) whenever you’re ready. You can find more information about my coaching services here — or just email me directly. Thanks for providing this great resource. Would you be willing to share what local blogging groups / facebook groups you belong to? It’s funny – as I’m reading your description I’m realizing that this is mostly what I do for my second job – but it’s all administrative and communications work for my church and we call it the “church administrator”! Interesting stuff! I’m wondering – what do you think about offering 5-10 hours of work for free to see if it’s a good match? I have never done VA work before, so I’m wondering whether that might be a good way to get my foot in the door, risk free for the client. Thanks! Yes, this could be a great idea. It would probably take more than 5-10 hours of work to make sure you really liked the position and to make sure it was all a good fit — but this would be a fabulous way to get your foot in the door. This is a wonderful resource – thank you! It’s perfect timing as I’ve recently been looking for VA positions as a recent college grad. Andrea, do you know of any reliable sites for VA job listings? I’ve seen a fair amount of listings, but aren’t sure about the liability of each site within the industry. Thanks for answering all these questions! VA work is so foreign to me. I think you are absolutely amazing with everything you have on your plate. Yay, thanks for posting this! I’m looking into becoming a VA – my “real” job has a crazy schedule which makes it hard to take on another “normal” job. Any information I can get is invaluable! HI Kate. I love my job as a VA, so I’d obviously highly recommend it. However, as I mentioned in the post, I honestly have no great tips or advice for how to find VA jobs. I’d suggest taking a look at the eBook I recommended at the end of the post — that has tons of information in it. This is great, Andrea! I have been working as a VA for three years… I prefer to call myself a marketing assistant, because that’s the type of work I do. But I get to do it all at home, I work around my kids, not wrapping my kids around work and for the most part it all works out great! I would love to read a post about how you schedule your work time around other things. Thanks for adding that! I know you’re busy. I’ve learned that getting up before my kids (now that I can) is invaluable to getting work done.